The encyclopedia this fish image is from (Encyclopedia Britannica, 11th Edition, Volume 12) is surrounded in quite a bit of controversy. It was one of the largest ever written and employed experts from around the world. The good news for folks like us? It is uniformly considered to be in the public domain. Meet the porcupine fish, also known as the globe fish or the sea hedgehog. 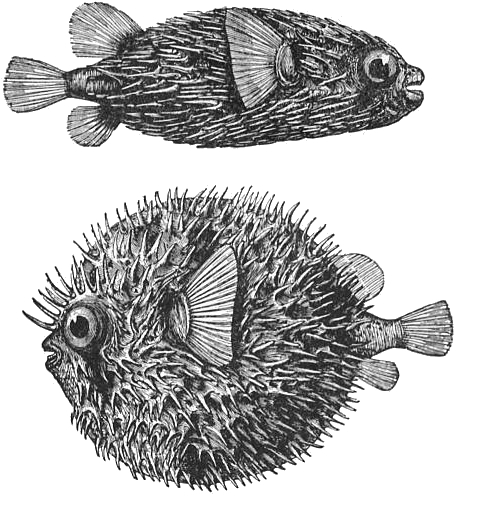 As you can see from this pair of drawings, this fish is one of the ones that most of us call blow fish. They can fill their stomachs with air to make themselves look bigger and less appealing to a predator. The porcupine fish takes that one step further in that when he swells, his spines protrude and make him formidable. Once the fish has ‘blown out’, he turns over and gloats belly upwards. Their fins are quite powerful but they do not have scales – instead of scales they have the spines which are so visible on the second fish shown on this porcupine fish drawing. Their jaws look a bit like the beak of a parrot. They can break off coral branches and chew other hard substances which they feed upon. They also eat decomposing or poisonous animal matter which in turn can make any other fish or humans that try to eat them sick. This charming fellow isn’t the only porcupine fish drawing you can find on Reusable Art. We also have a spotted porcupinefish drawing from the 1700s. It has some color and is much more fierce-looking.